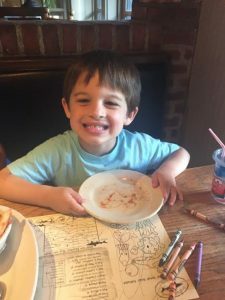 Children’s Speech and Language Services is a group of caring speech-language pathologists committed to helping your child have successful family meals. We serve patients from birth to 21 years of age that are experiencing feeding aversions, oral motor delay, difficulty swallowing, behavioral problem related to feeding, food refusal, poor weight gain, difficulty with texture transition, as well as G-tube to oral feeding transition. Our speech-language pathologists evaluate, consult, diagnose and treat children with swallowing and feeding difficulties. We provide ongoing individualized management for children and are dedicated to assisting families learn strategies for helping their children advance to their greatest potential. Our program focuses on building a foundation for oral feeding and developing oral feeding skills in a positive, child-friendly environment. Our feeding therapists use a variety of techniques including: SOS and Beckman Oral Motor. We help children experience meals through all the senses and reduce anxiety and discomfort in the process. Our personal goal is to create a pleasant environment that allows children to experience less stressful mealtimes with their family. We work towards establishing feeding patterns that promote optimal nutrition and growth while supporting the child’s development in physical, social, ethical and cognitive areas. We believe in finding a child’s strengths and helping family members learn to guide their loved one to more successful mealtimes. Happy Graduates of Dinner Detectives! 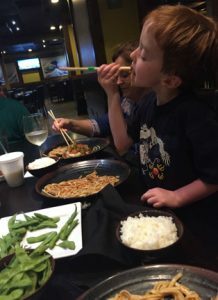 Learning to have positive experiences with food. Tolerating exploration of new textures and tastes during meals. Working on strategies to improve chewing skills. Varying the foods your child will attempt to taste and swallow. Increasing the volume of food your child eats and drinks. Generalizing new feeding skills to the home environment. Providing carryover tips and ideas for caregivers. Learn more about our feeding groups. “Our 7 year-old son struggles with significant sensory processing and autism spectrum issues. For several years, his diet has been limited to just a few bland and carb-heavy choices. His limited forms of protein have been from milk and cheese pizza. Left to his own devices, he would never venture from those two items. This kid’s olfactory senses are so exquisite, he can tell from the next room if we switched brands of cheese pizza on him. The ongoing battles over mealtime had become terribly stressful. But we experienced even more anxiety about his serious nutritional deficits. Through our speech therapy work, Aileen and Jenifer introduced us to their new Dinner Detectives class. 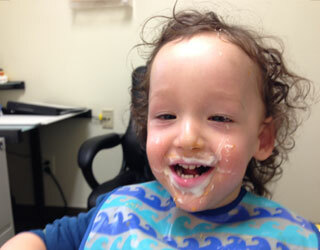 Halfway through the course, angels descended from above and our son’s eating habits completely transformed. 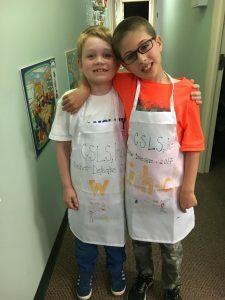 Aileen, Jen, and the other kids in the class all created a smart, fun, and low stress environment for experimenting with smells, textures, and flavors. Their methods are brilliantly effective. 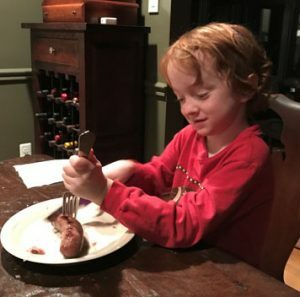 JP now voluntarily uses their techniques at home when trying new foods. Should I Be Concerned about My Child’s Feeding Skills/Behaviors? Is every mealtime a struggle with your child? Is your child having difficulty gaining weight? Does your child have poor nutritional intake? Does your child have difficulty eating after gagging or choking on a food? Does your child have gastrointestinal issues or been diagnosed with reflux? Is your child having difficulty transitioning to thicker textures? Is your child adverse to trying new foods? Is your child only eating a limited variety of foods? Does your child gag, turn away or make faces when he/she looks, smells, or touches certain foods? Is your child having difficultly sitting at the table or causing a disruption during mealtimes? Is your family not able to eat in a restaurant with you and your family?